To be able to use option 'auto_reload'=>false in production with Twig, I need to be able to force a recompilation. The easy way would be to clear the cache directory in the deployer when pushing an update, but if I'm micro-optimizing, why not ship built templates as part of the distribution? The next obvious question is, "How do I make twig compile templates without rendering them?" and it turns out there's a simple answer. The long form $twig->loadTemplate("name.twig")->render($vars) is the secret: loadTemplate writes to the cache if caching is enabled when the template is loaded. With that, it looks like the contenders are Smarty and Twig, currently at versions 3.1.14 and 1.13.2, respectively. How do they compare in a benchmark showdown? Since I've radically changed my work VM configuration, I needed to change my home PC in order to connect properly to the new setup. 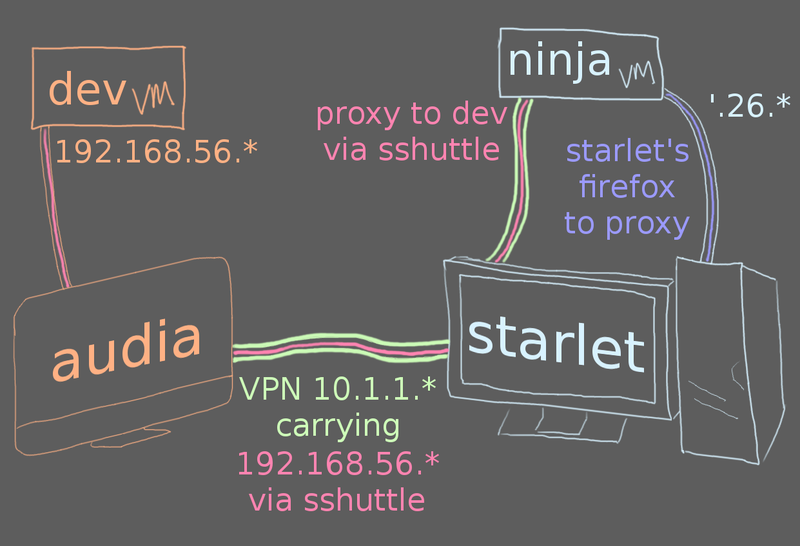 Before we dive in, a brief review of the old setup: the host at work, which we will call `audia`, ran a VirtualBox guest named `dev`. dev had its own set of configs and configuration knobs so that I could write 127.0.0.1 dev.audia.pc dev into /etc/hosts, point Firefox to dev:10080, and code running on dev would be able to recognize "this is development," not require TLS, and know that http://dev:10080/ is the URI root of the app. 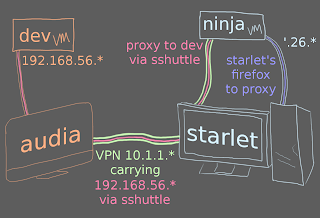 I configured VirtualBox's port forwarding to listen on 0.0.0.0 from audia, and when I connected to the VPN, my home computer (call it `starlet`) had its own /etc/hosts listing that used the internal IP of audia for dev. The same URI from home would then get connected via port-forwarding to the dev VM.